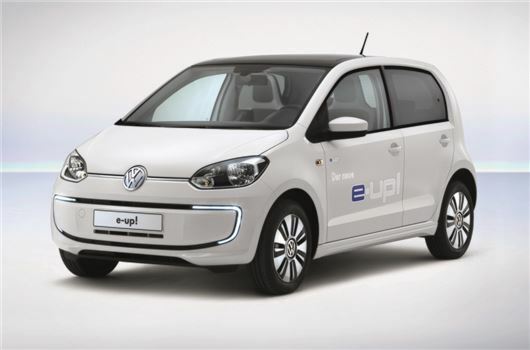 The electric Volkswagen e-Up goes on sale today priced at £19,250 including the £5000 Government grant. It's available from 24 specialist Volkswagen electric vehicle dealers with the first cars expected at the end of January 2014. It comes in one well equipped trim level getting 15-inch alloys, heated front seats, cruise control and the Maps and More navigation system, along with DAB, the City Emergency Braking system, rear parking sensors and climate control. The navigation system includes locations of charging points, range mapping and vehicle charging management functions, including the ability to pre-set the heating or cooling. The e-Up has a maximum range of 93 miles and a standard charge takes around nine hours from a standard household socket. There is the option of wall box which can recharge a completely flat battery in six hours. The e-Up also has a DC fast-charging circuit as standard which means a flat battery can be charged to 80 per cent in 30 minutes, using a DC supply. The electric motor in the e-Up develops 82PS with 210Nm of torque which gives a 0-62mph time of 12.4 seconds and a top speed of 81mph. There are two extra driving modes - Eco which cuts the vehicle’s peak power to 50 kW and reduces the output of the air conditioning system while Eco+ limits maximum power to 40 kW and further modifies the throttle response along with disabling the air conditioning. Certain vehicle functions can also be operated remotely using Volkswagen’s Car Net services on an iPhone or Android smartphone. The e-Up comes with a three-year Car Net subscription that allows owners to control or get information on charging status, battery management, doors and lighting, driving data, climate control and the location of the vehicle. The e-Up has a standard three-year warranty, with the option to extend this by one or two years. The battery comes with an eight-year 100,000-mile warranty, while the standard service interval is 10,000 miles or one year, whichever comes soonest. The perfect town car for two! I drive a high spec Up! and longest journey I do is 11 or 12 miles one way. If this version handles and drives as well as mine, I would seriously consider it. Only worry...heated seats...that, some power drain!